You can use CiviCRM to send an email to individuals. Using CiviCRM for this purpose is useful if you want other people at your organisation to see the email or if you want to send an email based on a pre-defined template. Use the Quick Search box on the top left. Click inside the box and begin typing a part of the person's name or email address. Choose the person from the choices that are presented. Navigate to Search > Find Contact. Enter part of the person's name or email address. Click Search and click on the person's name when it shows up on the search results screen. From the contact summary page, click Actions > Send an email or click the Activities tab and choose Send an Email from the dropdown menu. You can add additional recipients using the CC and BCC fields. If you have templates defined, you can choose one from the Use Template dropdown menu. 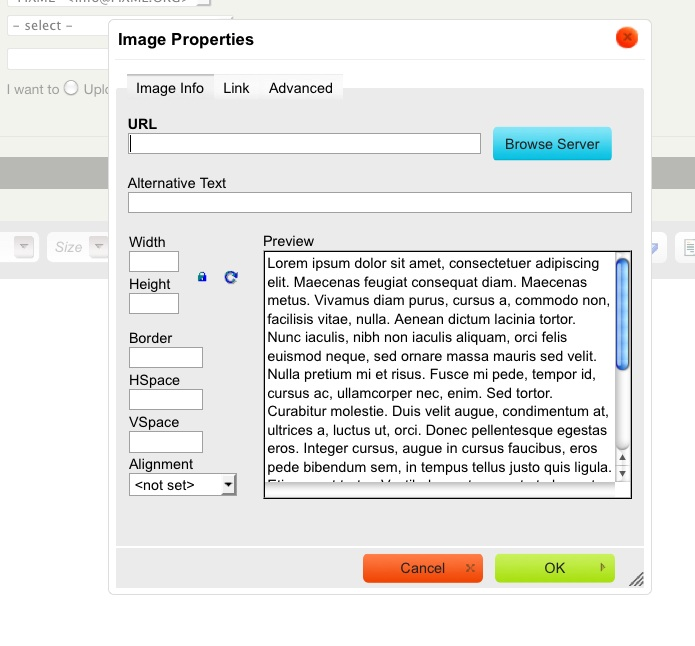 Selecting a template populates the text content and HTML content fields with the message content from the particular template you have chosen. You can then edit that content. Enter your content or add content to your template. If you just wish to send a Plain Text version of your email, ignore the HTML Format section and click on the Plain Text Format section. Enter your message in the box. Click Send to send your message. To see the activity that was just recorded of the email sent, click the Activities tab of the contact. In the results from a search, CiviCRM makes "Send Email to Contacts" available from the actions dropdown menu. This allows you to send an email to more than one contact at a time. Sending an email this way is relatively quick, but it provides no options for tracking email and doesn't give contacts the option to opt out. It is bad practice to use this method for mass mailings, which is why it is limited to 50 contacts. For mass mailings, use CiviMail. Click Search > Find Contacts (or Advanced Search). Choose your search criteria and click Search (or use any other search to find the contacts that you wish to email). From the search results screen, choose some or all of the contacts and click Actions > Email -send now (to 50 or less). Follow the same steps as in sending an email to one person. Each of the recipient contacts will have this email recorded as an Activity in their record. An activity will also be recorded for the sender. The activity record will also list all the other message recipients. Unlike with mass mailing (see below) there is no one place where all emails sent via the Send Email function are listed. Click the image button in the WYSIWYG editor. The Image Properties window will appear. Click Browse Server to look for image files on your server. In the left sidebar, you will see a directory of files. 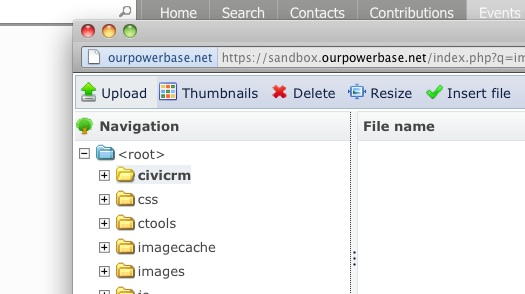 If the image you need is already uploaded to your server, navigate to it in the directory and select it. If not, Click Upload to choose a file from your computer. Your computer's file-browsing window will open. Find the image file you want, click to select it and click Open. You can repeat this process to upload multiple files to CiviCRM at once. To insert, double click on the image you want. 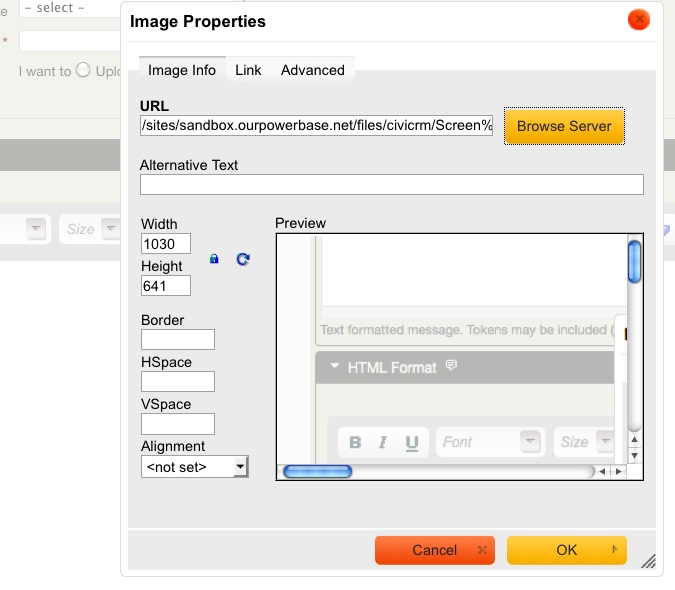 You'll return to the Image Properties window of your email. Here you can add adjust the size and alignment of the image and the border around it. You can also fill in the Alternative Text field, which is text that appears when the image is not available to the reader (if they choose not to load images in their email client, or are using a screen reader due to a visual impairment). The alternative text ensures no information is lost; it's a best practice to always include alt text for images to make email accessible to all user communities.